Rather Dashing Games sponsors Origins Game Fair 2016! Today, Rather Dashing Games, publisher of quality family and hobby board games, announced its sponsorship of the 2016 Origins Game Fair in Columbus, Ohio, June 15-19. A regular exhibitor at Origins since 2012, Rather Dashing has increased its commitment to the convention as a sponsor. RATHER DASHING GAMES, based in Kentucky, is owned by Kalmbach Publishing Co. of Waukesha, Wis., and boasts a catalog of entertaining games including Pirates, Ninjas, Robots & Zombies; Graveyards, Ghosts & Haunted Houses; Four Taverns; and Dwarven Miner. For more information, please contact Jeanne Sidner at 262-798-6647. We Come in Peace blasts its way into the market this summer – Prepare for the invasion! Ready your blasters and scramble your missiles in this game of exponential chaos! The Alliance of Six Planets has come to an end – and now you must do what it takes to defend your home world from the hordes of flying saucers that darken the skies and lay waste to your cities. 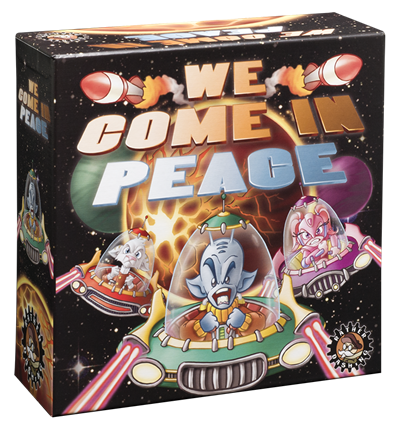 We Come in Peace, the latest release from the creative minds at Rather Dashing Games, is a fast, fun, strategic dice game for 2 to 6 players, ages 8 and up. Every turn, use an increasing number of Invasion dice to attack your opponents and Defense dice to fight back when they come after you! Resources are limited, and you can’t stop all the invaders. Choose how to best employ Blasts or Interceptors to repel enemy flying saucers, rebuild cities destroyed in the onslaught and launch Missiles directly at your opponents’ planets. Be the planet with the least damage at the end to claim a victory of galactic proportions! We Come in Peace is played in three rounds. A simple scoring system makes this game easy to learn and play. We Come in Peace is anything but peaceful and is as much fun to lose as it is to win. We Come in Peace joins Rather Dashing Games’ already stellar catalog of easy-to-play games including the Drawn and Quartered series – Pirates, Ninjas, Robots & Zombies and Graveyards, Ghosts & Haunted Houses – and other favorites such as Four Taverns and Red Hot Silly Peppers. To order We Come in Peace, please call 800-558-1544 or email tss@kalmbach.com. RATHER DASHING GAMES, based in Kentucky, is owned by Kalmbach Publishing Co. of Waukesha, Wis. For more information on We Come in Peace or Rather Dashing Games, please contact Jeanne Sidner at 262-798-6647.